I’ve spoken before about the bidding war that my overlapping local PBS stations had going on during the 1980s once they realized what a cash cow DOCTOR WHO was for them come pledge break time. As a result, they would pick up the rights to any DOCTOR WHO material that was available, as well as to any show in their UK distributor’s catalog that even cursorily resembled WHO. Which is how I came to be one of the earliest fans of RED DWARF, back in 1988. As part of their pledge period, the station had decided to run the twelve existing episodes as a marathon, with pledge breaks interspersed in-between each episode. And despite some promotion beforehand (where they insisted on calling the show The Red Dwarf) I had no idea what it was or that it was going to be on. So on that Friday night, channel surfing, I stumbled across part of one episode, watched it to the end, flipped away when the pledge drive came back on, eventually flipped back and watched the balance of whatever episode was then on. I did this three times or so before I’d been lured in enough to sit through the pledge breaks. Even then, exhaustion took me–but not before I’d popped a VHS tape into the recorder and set it to record as much of what remained as was possible (which turned out to be three of the last four episodes) I then spent the next week or two getting my hands on copies of the episodes that I had missed. RED DWARF is a science fiction situation comedy–or at least it was that at the outset. It’s kind of morphed and changed over time and over seasons. But in the early days especially, when they had no money and no support, it was the story of Dave Lister, the lowest-ranked crewman aboard the Jupiter Mining Company vessel Red Dwarf. Lister is a slacker, a slob, an uncouth lout, but he does have a plan for his life. That plan goes balls-up when it’s discovered that he’s smuggled a cat on board despite the strict quarantine regulations. As punishment, Lister is put into stasis, losing his pay for the voyage. It turns out that he loses more than that, as he is revived three million years later by the ship’s computer Holly, and told that the rest of the crew died shortly thereafter in a radiation accident. Now, Lister is the last human being alive, his only companions being a creature that evolved from his pregnant cat, and a hologram simulation of his dead bunkmate, Arnold Rimmer. In essence, RED DWARF became a Waiting For Godot-style series that’s entirely about the interactions of this limited cast of characters against the backdrop of this enormous empty ship–and with occasional wrinkles being thrown in via a variety of science fiction tropes. Creators Rob Grant and Doug Naylor made their lives even more difficult by deciding early on that there wouldn’t be any aliens in the show. So while Red Dwarf might encounter remnants of human society (such as the mail pod that had been trailing the ship all that time), it was difficult to bring in other people. That changed a bit beginning in the third season, when the show had proven to be popular enough for it to get a bit more money, and a deliberate choice was made to lean harder into the science fiction elements. Most people prefer the later RED DWARF, and there have certainly been some knockout episodes. 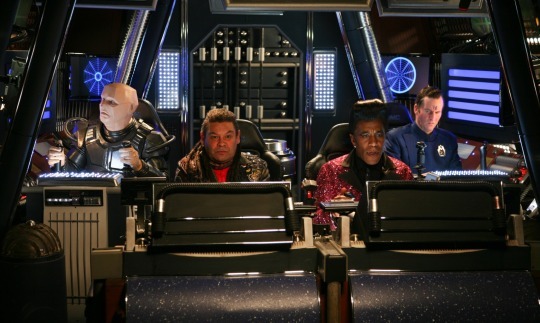 But it may be because that;s how I was first exposed to the show, but I prefer the set-up and approach of the original two series–the more somber opening, the limited cast, the original Red Dwarf design (it was reworked several times over the course of the series), and the original cast–Norman Lovitt was replaced as Holly in the third year by Hattie Hayridge, who was nice but not as good in my opinion. And Kryten, the one-off android from the second series, became a series regular, the showrunners having realized how difficult it was to get things to happen in their plots when one of their three characters couldn’t touch anything, and the other didn’t have the attention span to really care. The amazing thing about RED DWARF, really, is its absolute refusal to die. Every couple of years, a new series would get made, and then another, and then another. Last year saw the release of RED DWARF X, the tenth series, a full 24 years after the show began, and with virtually the same cast still in place. (Norman Lovitt, who played Holly, wasn’t a part of this series, but Robert Llewellyn, who had portrayed the android Kryten since the third series, was still there.) And now, word is that two more series have been commissioned, which will air in 2016.